Good morning! I'm sorry for my lack of posting the last few days. It's taken me a lot longer to prepare for my upcoming BOGO event than anticipated. I have a LOT of things that are retiring! There's still a chance for you to attend the event, just send me an email to let me know you'd like to come! 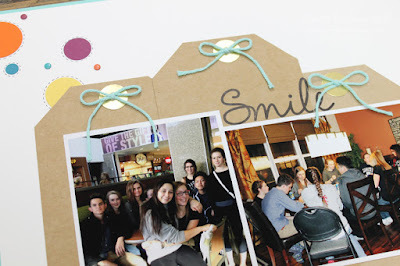 I couldn't let another day go by without sharing a project and realized I hadn't shared this birthday layout I did for Jordyn's 16th birthday party. I used Kraft cardstock (I love that cardstock) to create 3 tags which ended up being in the background. Then added a few circles in a variety of sizes and did some faux stitching around the circles. Don't forget that tomorrow (June 2nd) is the last day to order from the 2014-2015 catalogue! Check out the most recent retiring product list, pricing and availability by clicking the link below. Tomorrow is also the day the 2015-2016 catalogue goes live! Woot! Woot! View the retiring product list pdf.